Dont worry people we are back from our little hiatus and coming back daily. Thanks for all the emails and questions over the past couple weeks. We are kicking off our first post in a couple days with Meat Free Monday. Sir Paul McCartney has followed in the footsteps of the world's leading climate scientist and a small Belgian town by calling on people to go meat-free one day a week and cut carbon emissions. Backed by celebrities ranging from Chris Martin to Sheryl Crow, McCartney today launched his Meat Free Monday campaign asking households to cut out meat on Mondays and slow global warming. Last year the world's leading authority on climate change, Dr Rajendra Pachauri, told the Observer that going meat-free once a week was the "most attractive" way for individuals to reduce emissions. Sir Paul McCartney said, "I think many of us feel helpless in the face of environmental challenges, and it can be hard to know how to sort through the advice about what we can do to make a meaningful contribution to a cleaner, more sustainable, healthier world," said McCartney. "Having one designated meat free day a week is actually a meaningful change that everyone can make, that goes to the heart of several important political, environmental and ethical issues all at once." 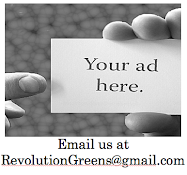 Why not join the Revolution Greens team and go meat free once a week. Check out the video and link to the website.